On a Saturday autumnal equinox, over three dozen fracking protesters from Idaho, Oregon, and Washington participated in the Global Frackdown! 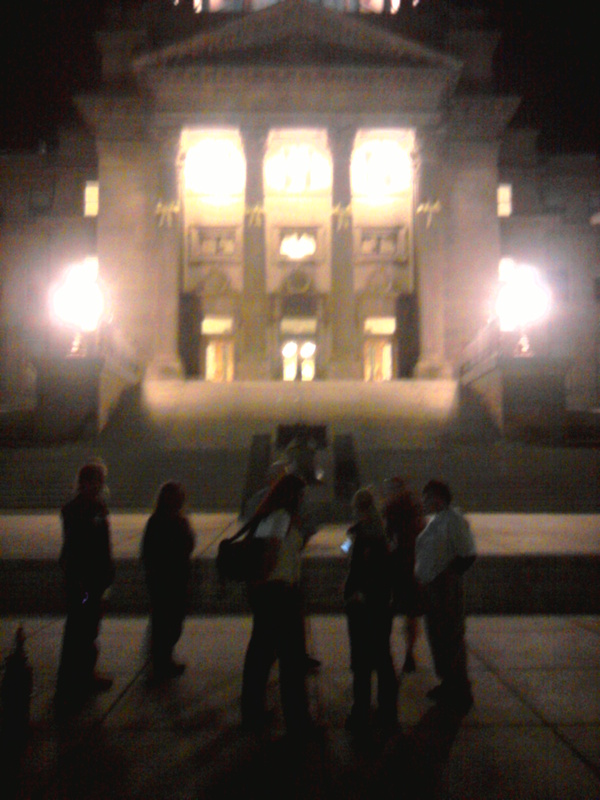 in Boise on the Idaho Capitol steps. 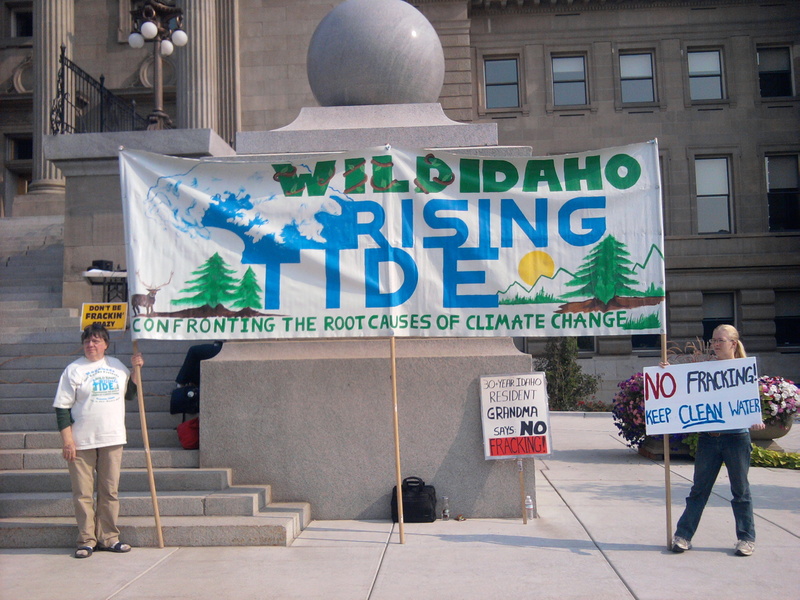 In conjunction with similar demonstrations in 200 places around the world, the mid-day rally and evening message projection drew leadership and support from Idaho Residents Against Gas Extraction, Wild Idaho Rising Tide, United Vision for Idaho, Occupy Spokane, Occupy Boise, the Ontario Autonomous American Indian Chapter, GMO Free Idaho, and concerned citizens of the region. 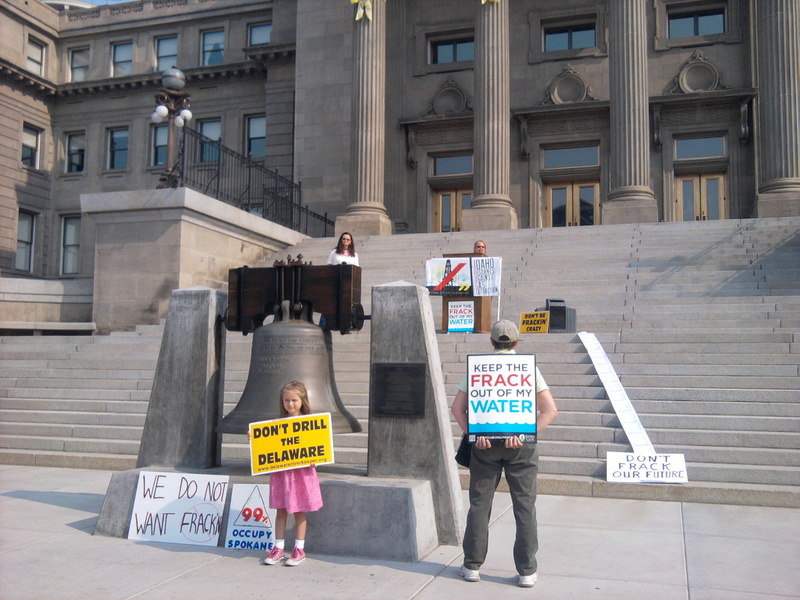 Organizers, speakers, and protesters attracted local television news coverage as they exposed the potential risks of looming hydraulic fracturing (“fracking”) and waste ejection wells in Idaho, called for stronger government oversight, and launched an informal statewide petition requesting a ban of these processes that contaminate water, air, and land. 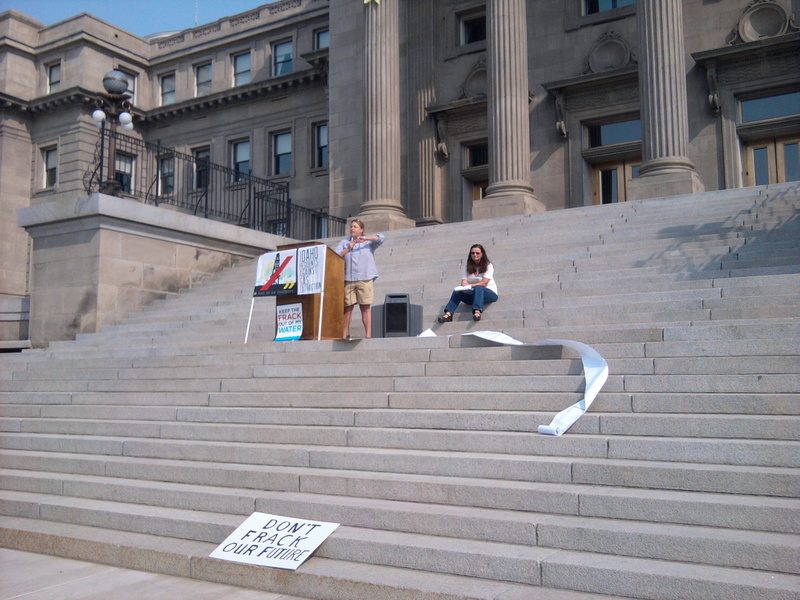 Alma Hasse of Idaho Residents Against Gas Extraction addresses protesters near an unfurled list of known carcinogenic chemicals in fracking fluids. 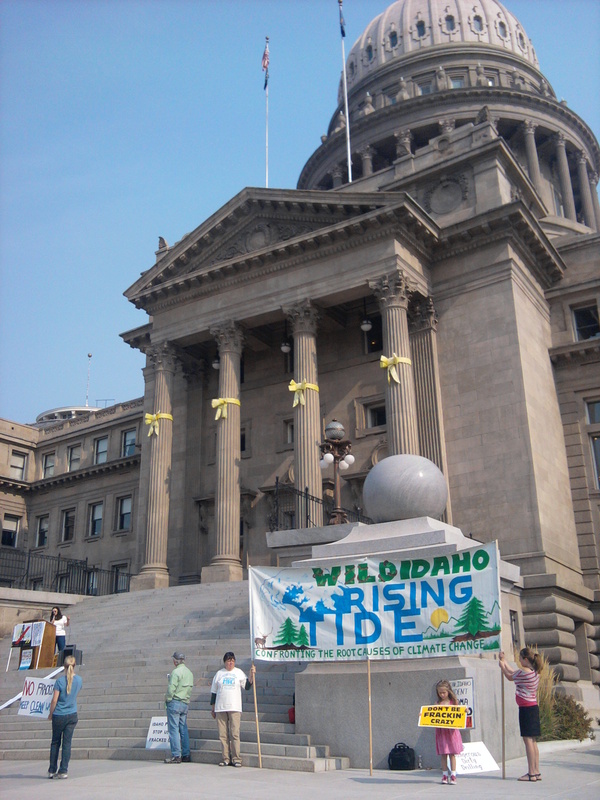 Wild Idaho Rising Tide activists display the group banner in protest of impending fracking in Idaho. 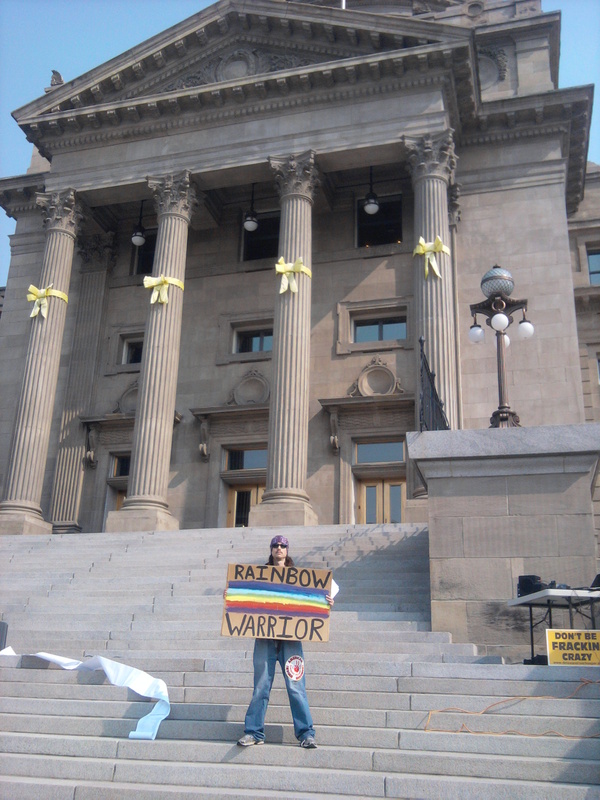 Terry Hill of Occupy Spokane composes a photo of Global Frackdown! in Boise participants. 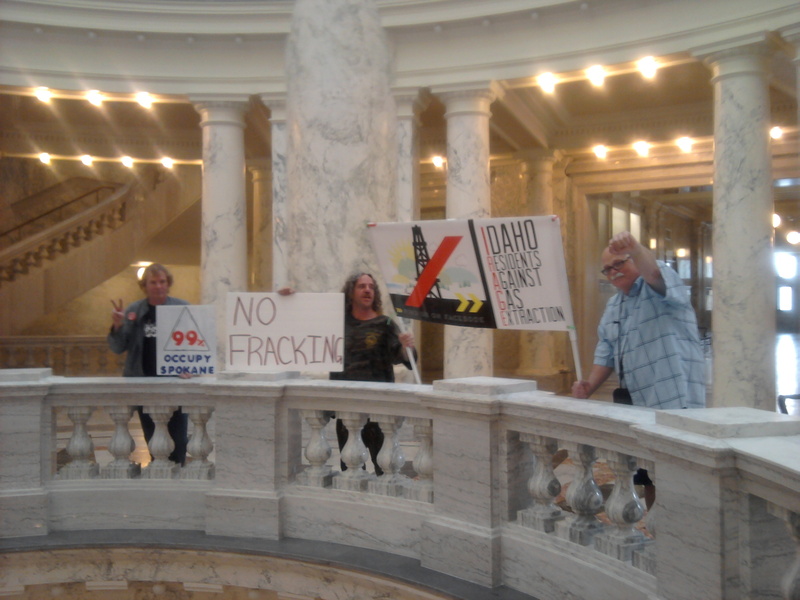 Alma Hasse of Idaho Residents Against Gas Extraction outlines the dangers of fracking, while concerned citizens converge with their protest signs and banners. 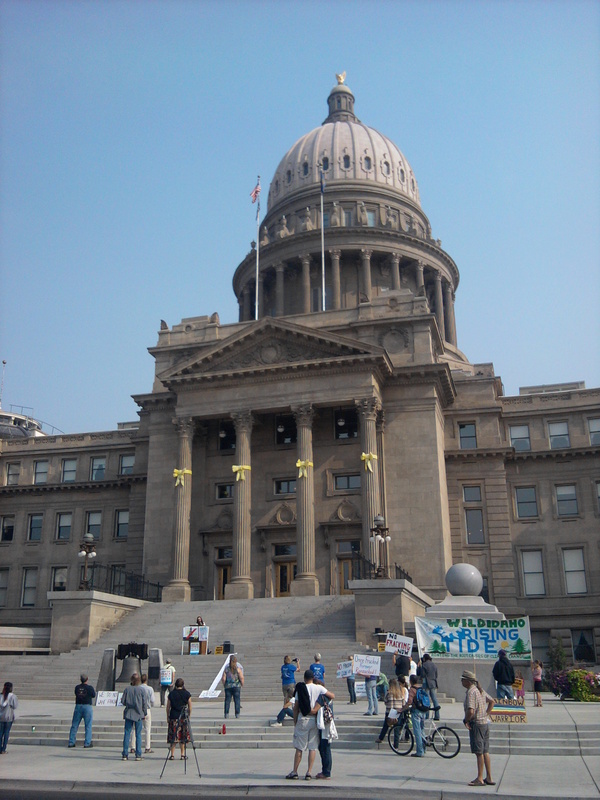 The Idaho fortress of political inertia towers over citizens demanding a reliably healthy environment and future without fracking. 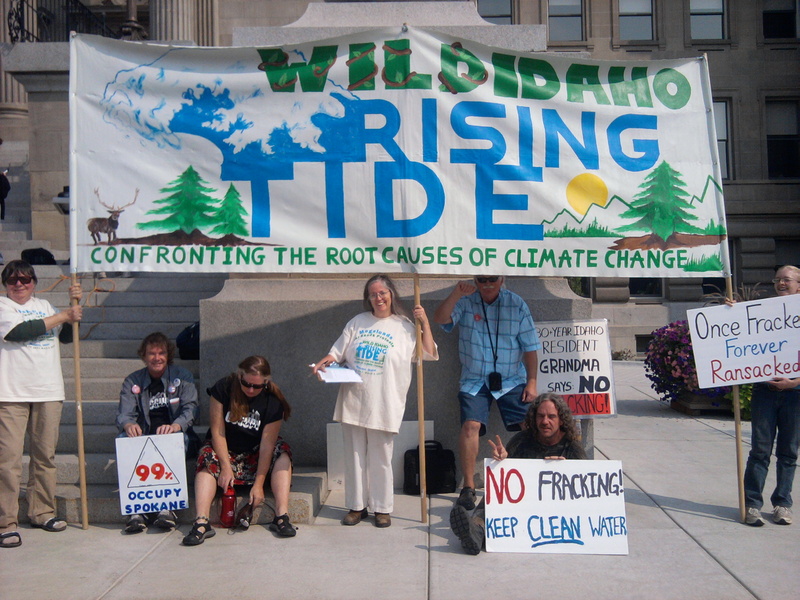 Over three dozen fracking protesters from across the region participated in the demonstration that drew support from Idaho Residents Against Gas Extraction, Wild Idaho Rising Tide, United Vision for Idaho, Occupy Spokane, Occupy Boise, the Ontario Autonomous American Indian Chapter, GMO Free Idaho, and concerned citizens and children. Onlookers and protesters from Idaho, Oregon, and Washington listen as Alma Hasse of Idaho Residents Against Gas Extraction explains the risks of fracking in Idaho. 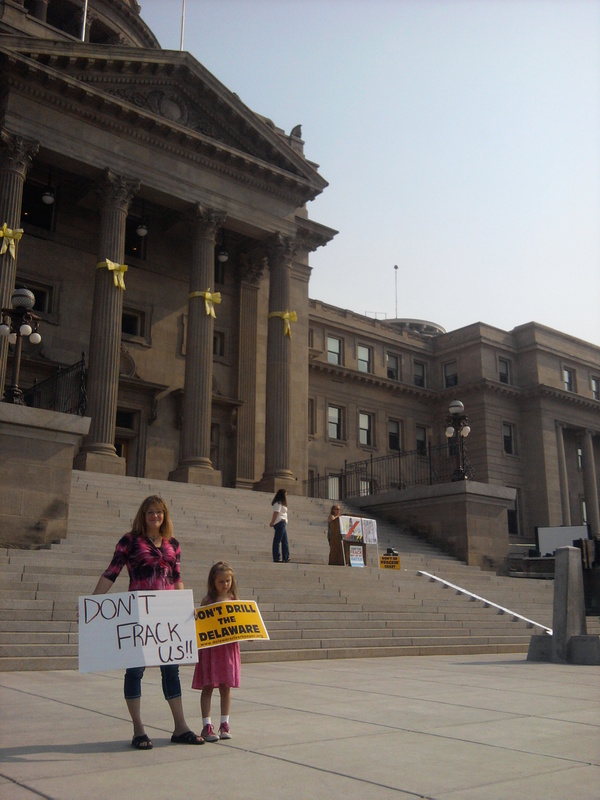 Jennifer and Jillian Carter pose with their fracking protest signs, as Tina Fisher of Idaho Residents Against Gas Extraction describes the myriad complications of looming natural gas fracking in Idaho. 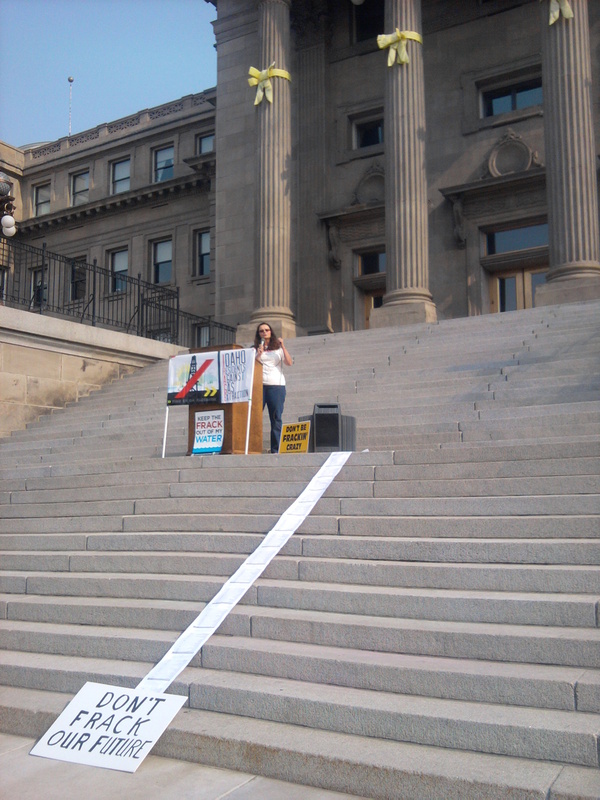 Two generations of demonstrators and plenty of protest signs grace the statehouse steps, as Tina Fisher of Idaho Residents Against Gas Extraction talks about banning fracking practices statewide. Jennifer Carter relates her initial surprise and ongoing concerns about looming hydraulic fracturing and waste injection wells in Idaho. 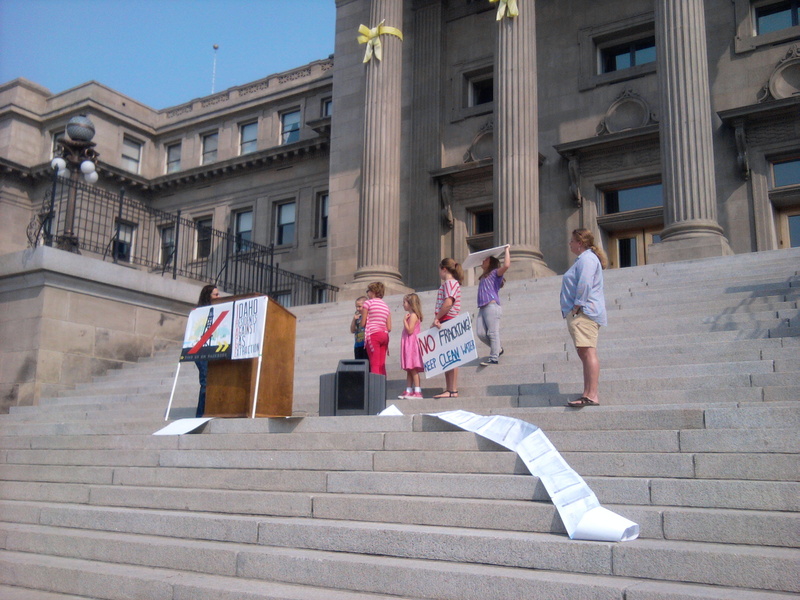 Jennifer Carter encourages Idaho citizens and elected and appointed officials to consider the impacts of fracking on children and future generations. Mato Woksape wields his sign depicting the broad resistance of people all over the world defending the Earth and its life from industrial incursions like fracking. 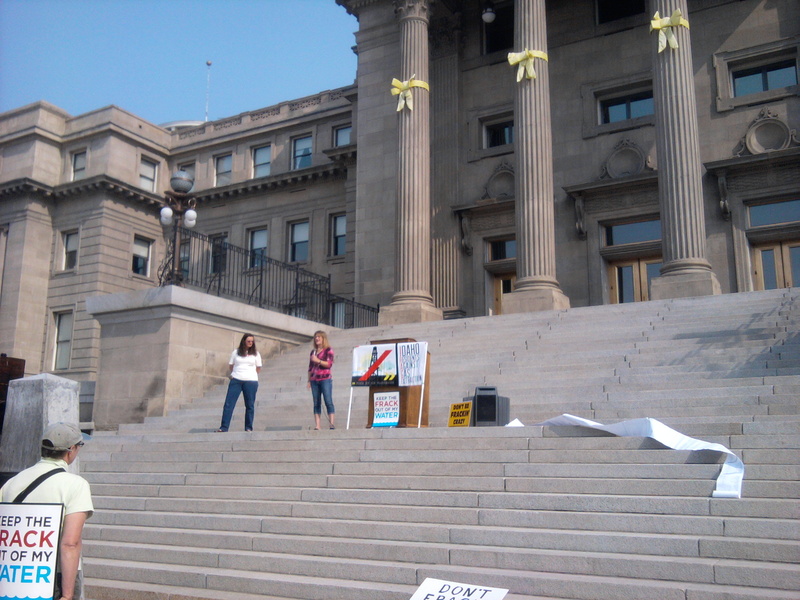 Adrienne Evans of United Vision for Idaho rouses the crowd of protesters to hold Idaho legislators accountable and ban fracking in the state. Adrienne Evans of United Vision for Idaho details the difficulties induced by fracking throughout the country, which could similarly occur soon among Idaho agricultural communities. 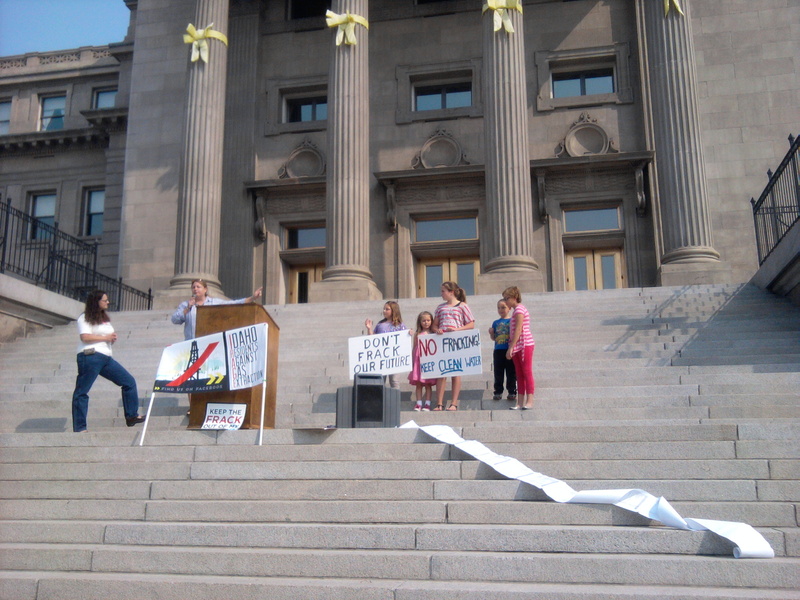 Idaho children voice their concerns over potential fracking effects on their health and environment. 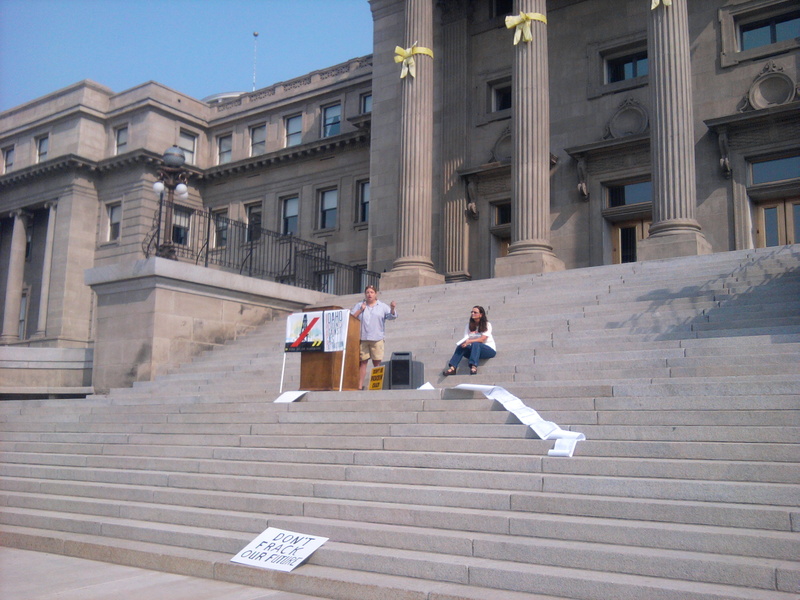 Young speakers at the demonstration pass the microphone, as they courageously denounce fracking and its multiple possible impacts on their future lives. 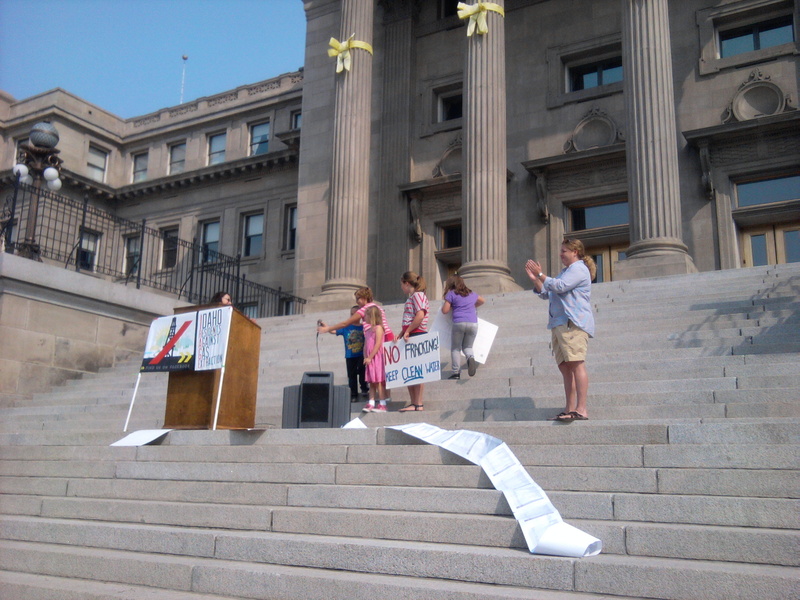 Adrienne Evans of United Vision for Idaho highlights the social injustice of imposing the costs of looming natural gas fracking and current energy usage on children. 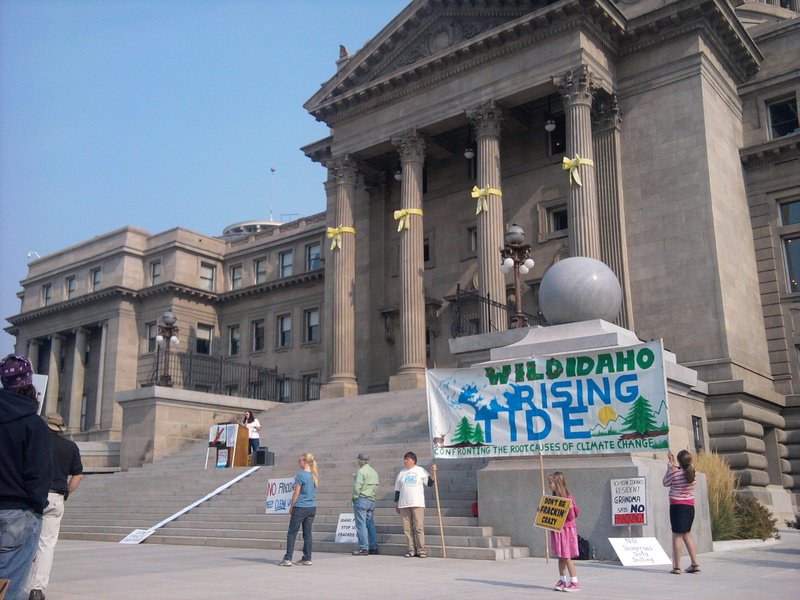 After traveling hundreds of miles to support a fracking ban in Idaho, Occupy Spokane and Wild Idaho Rising Tide activists huddle after the rally. 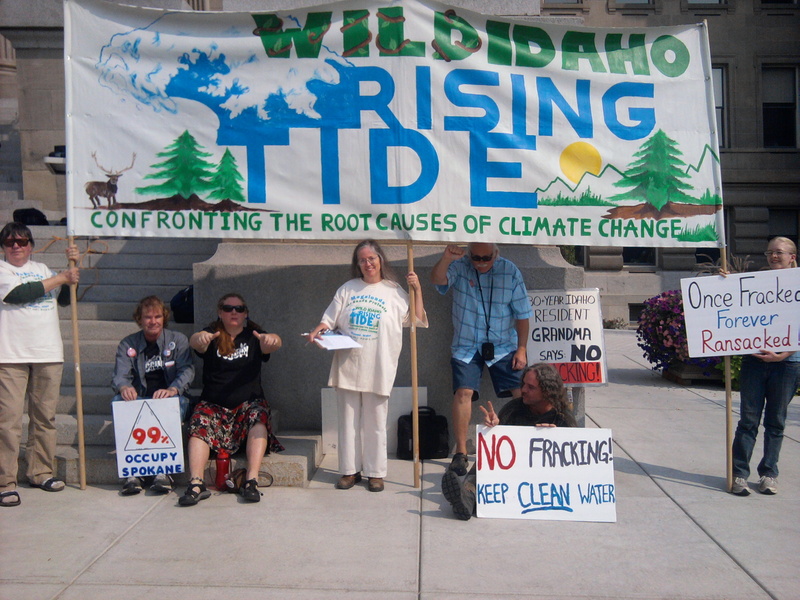 Occupy Spokane and Wild Idaho Rising Tide protesters share some solidarity while the Global Frackdown! 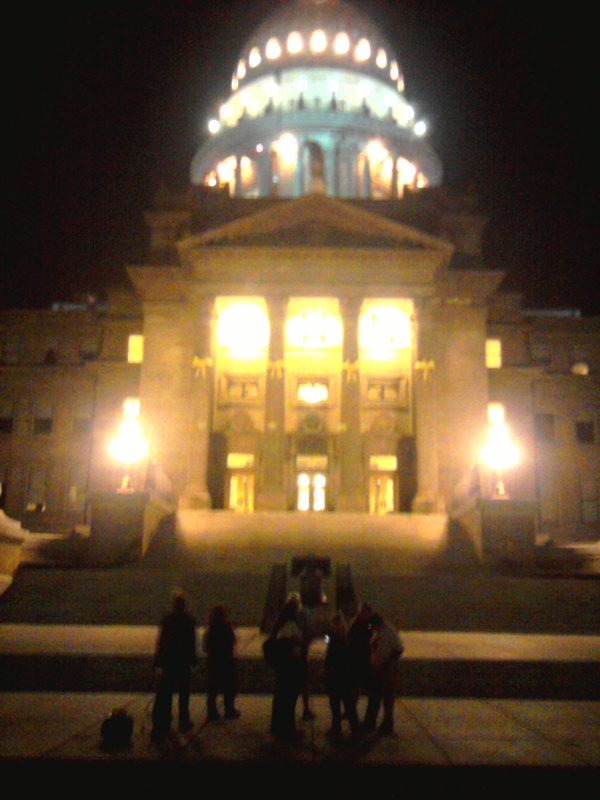 in Boise disperses. 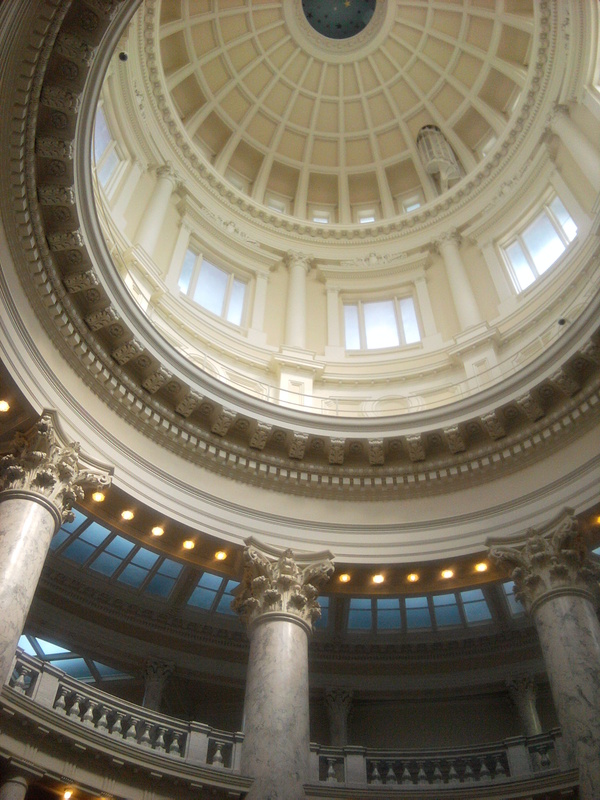 Will the dome of the Idaho Capitol ever shed enough light on state legislators obliged to protect public health and safety from toxic energy extraction processes like hydraulic fracturing? 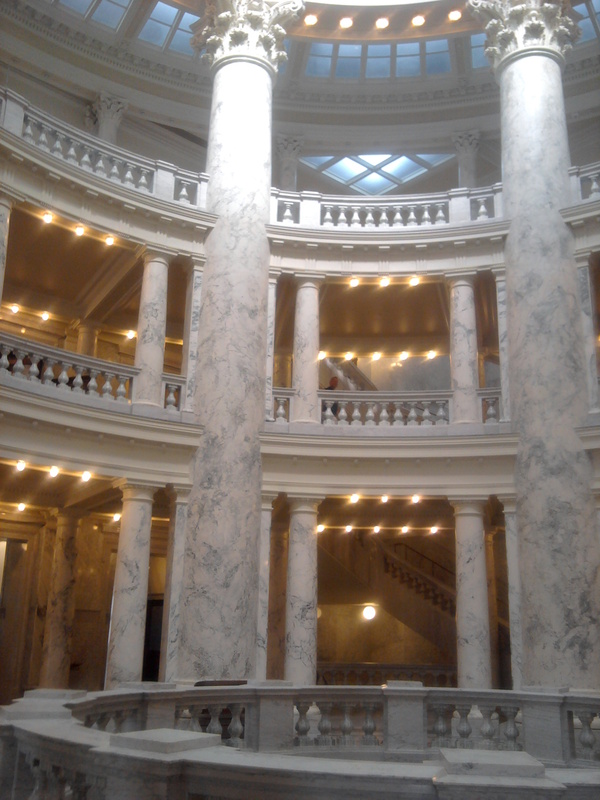 The Idaho halls of purported democracy tower seemingly uninfluenced by the deep well of citizen concerns about emerging fracking in the state. 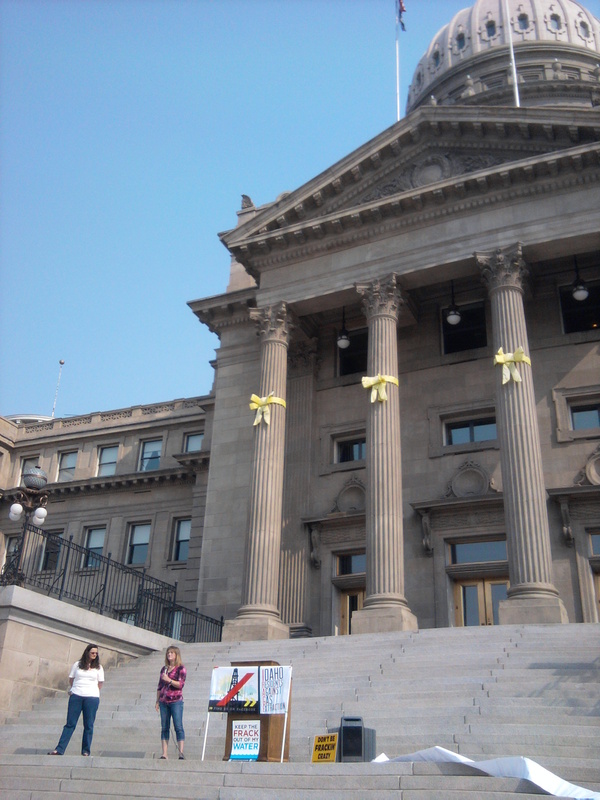 Occupy Spokane activists, 400 miles from their home streets, stand in solidarity with their Idaho comrades objecting to fracking in Idaho. 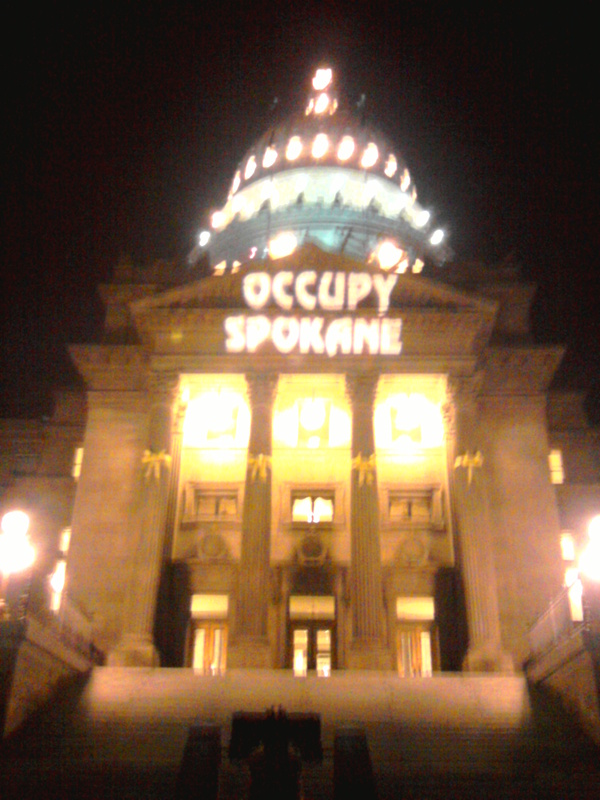 Occupy Spokane illuminates the Idaho Capitol, as Global Frackdown! 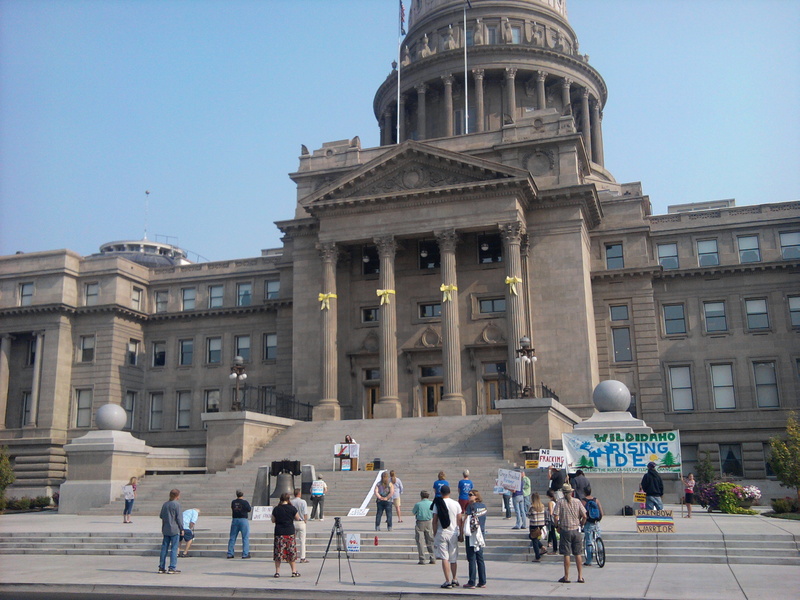 in Boise protesters return to the statehouse later in the day. 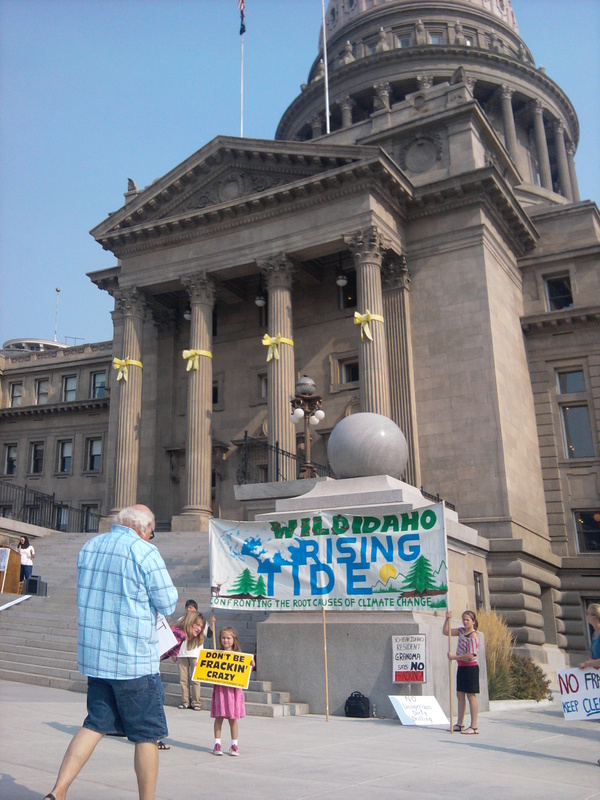 Activists from three Northwestern states, representing thousands of members of Idaho Residents Against Gas Extraction, Wild Idaho Rising Tide, Occupy Spokane, and other groups, declare fracking off limits in Idaho and everywhere. 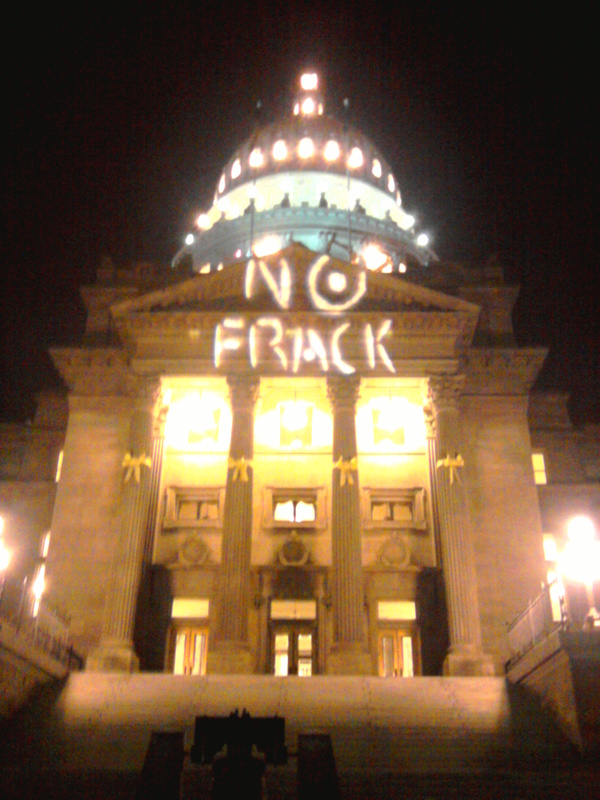 When our Idaho legislators ignore our anti-fracking pleas to value communities and places more than corporations and profits, we must resist with the light of truth (Alma Hasse photo). 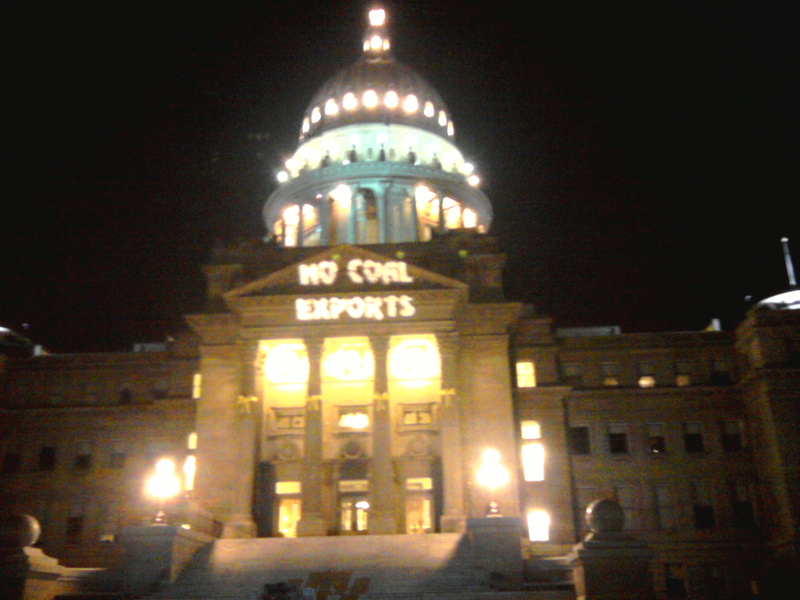 After their successful actions at the Montana Capitol in Helena in mid-August 2012, protesters denounce coal exports from the Powder River Basin in Montana and Wyoming, along rail lines through Idaho, Washington, and Oregon, to West Coast ports and China. 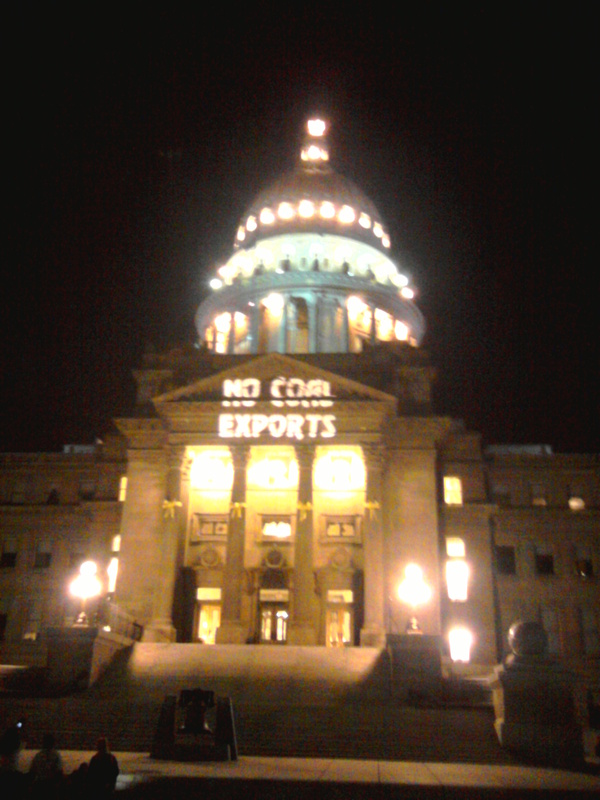 Occupy Spokane activists and their Boise and Moscow colleagues reject coal exports from the Northwest to Asia or anywhere. 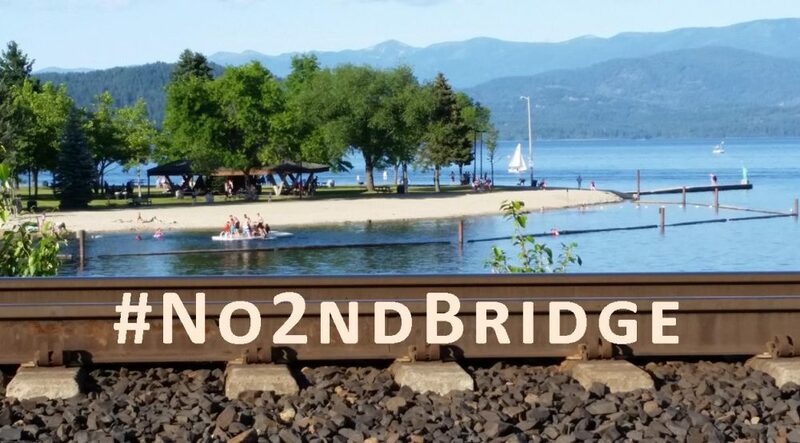 As coal companies continue to bring Appalachian mountains and residents to their environmentally and financially impoverished knees, will coal exports kill Northwestern places and people too? Lung disease in miners, polluted streams in communities, acidic deposits in rains and oceans, escalating climate change, and increasingly deadly coal train wrecks: Americans and King Coal still mostly deny that coal kills. 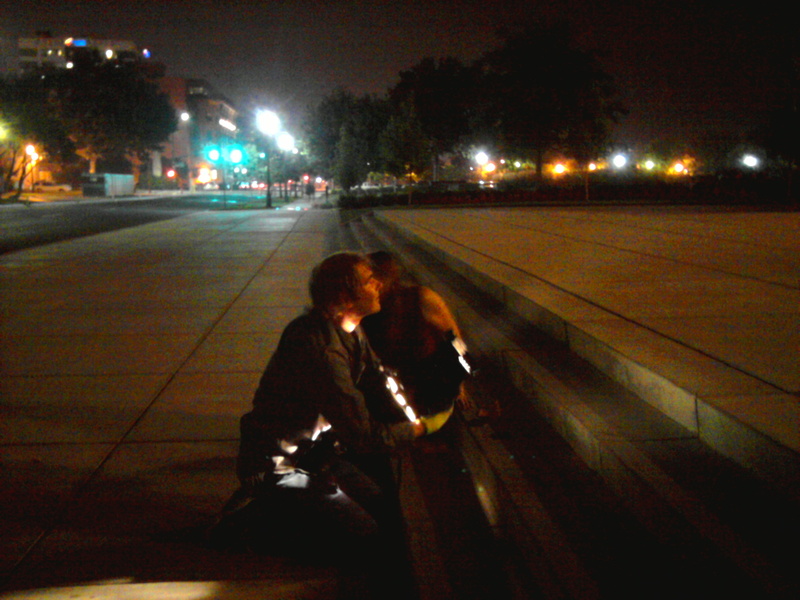 Valerie Waley and Ziggy of Occupy Spokane work their light projection magic. 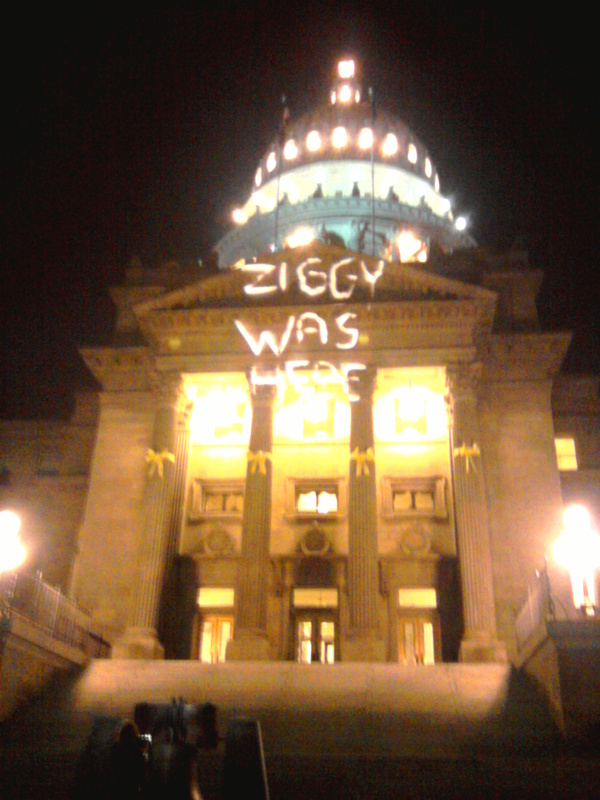 Occupy Spokane fracking protester Ziggy leaves his mark on the Idaho Capitol. 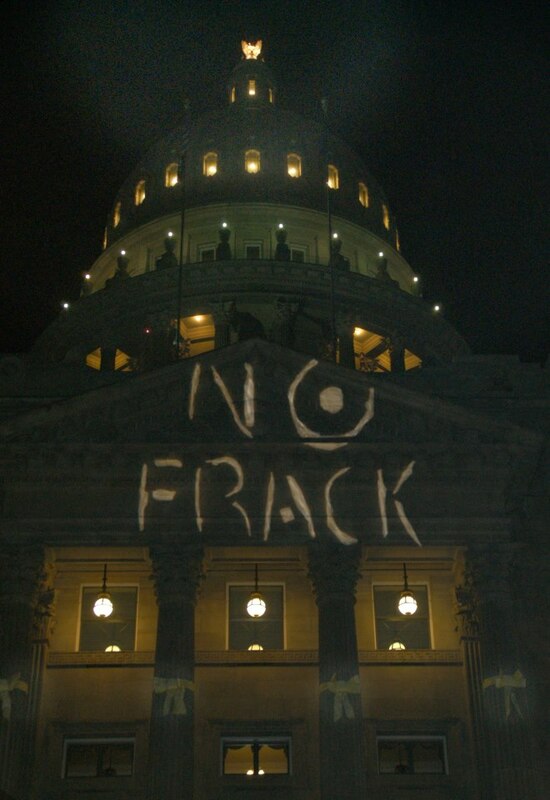 As the final message projection action of the Global Frackdown! 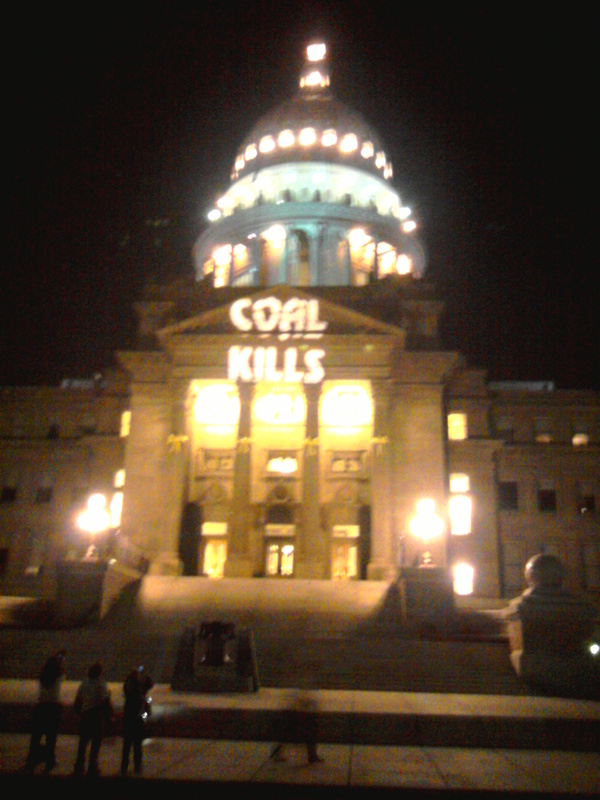 in Boise concludes, activists contemplate their next maneuvers to ban fracking, coal exports, and tar sands megaloads in Idaho. 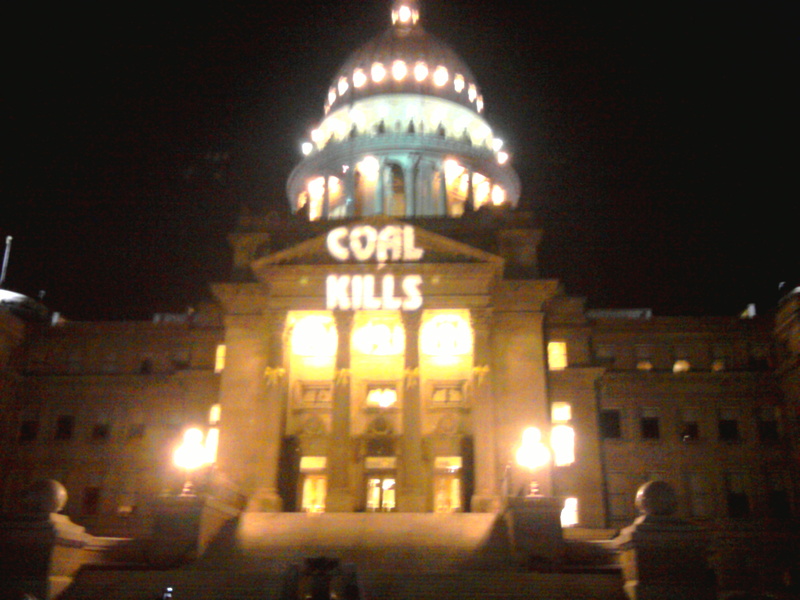 The statehouse glows warmly behind Northwest activists intent on freeing fellow Americans from the social and environmental oppression of fossil fuel hegemony.